Matthew Gipson, Ahmet Gueye and Milos Zivanovic give the Rainbows needed depth on the front line. Can UH's big men protect the basket? This is the fourth in a five-part series looking at some of the questions facing the UH basketball team as it heads toward Saturday's season opener against nationally ranked Michigan State. AHMET GUEYE has yet to play a Division I game. Stephen Verwers will have to wait until next season to get on the court. 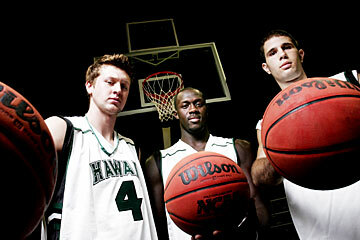 But both have already made an impact among -- and on -- the Hawaii basketball team's big men. Who: Hawaii vs. No. 4 Michigan St.
"They're big guys and they'll bang with you every day," UH senior Matthew Gipson said. "I've got bruises all over my body from them. It's tough." The UH newcomers have turned up the physical play during practice and the Rainbow Warriors hope the interior battles in the preseason will help the big men defend the bucket once the season starts. "We have to play better post defense than we've been playing in past years without fouling," UH coach Riley Wallace said. "Keep the guys off the block, don't give them the easy buckets. If we improve our defense and rebounding, the offense will be there." Gueye was recruited from Salt Lake Community College to give UH a physical presence in the paint and joins a front line that includes Gipson and centers Chris Botez and Milos Zivanovic, all seniors. Zivanovic is expected to miss the first month of the season due to a broken bone in his left thumb. Verwers, who played at Colorado State last season, will redshirt this year due to transfer rules. Despite having a tall front line, the Rainbows averaged fewer rebounds than their opponents last season and ranked last in the WAC in defensive rebounds. Wallace is looking for improved play on the boards, which could then fuel the up-tempo attack UH has worked on in practice. "The rebounding drills we've worked on have been much more intense than in recent years," Wallace said. "So let's hope that carries over into aggressiveness on the boards in games." "That's all about one thing and that's about playing hard," Gipson said. "Defensive rebounding is 90 percent hustle and want-to and 10 percent technique." Gueye, who admired Dikembe Mutombo's shot-blocking ability as a youth growing up in Senegal, is still learning the UH offense, but prides himself on playing defense. He snagged nine rebounds and blocked five shots in UH's exhibition game against Hawaii-Hilo last Friday. "Ahmet gives us an inside presence we haven't had in a while," UH associate coach Bob Nash said. "He has great timing, probably about a 7-1 wing span at 6-7. So his timing is deceptive, he gets there quick and he can jump so he gets his hand on a lot of balls." "When you block somebody's shot you know they won't want to come back, because it's going to be in their mind that you blocked his shot," Gueye said. "You've put him down mentally already." Botez started 27 games at center last season and used his long reach to rank fifth in the Western Athletic Conference in blocked shots with 41. "We've got some really tough teams coming up and I know they're going to be coming out banging and we just have to start banging them first," Botez said. Gipson struggled in his first season at UH, but returned more comfortable with the system and with greater confidence. He's worked on his post game in the offseason, but remains more comfortable floating to the perimeter and knocking down jumpers. "When he's free and easy and having his way he's as good as anybody," Nash said. "Right now he's playing the way we had envisioned him playing last year. If he can continue that then we can put a lot of pressure on a lot of teams." Zivanovic will add depth to the front court once he recovers from his injury. 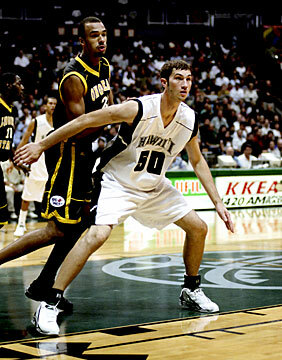 The fifth-year senior is the 'Bows' last link to the 2000-01 WAC championship team. Key stat: UH was 12-2 when outrebounding its opponent last season, and 3-11 when losing the battle on the boards.